Excavations at Mucking, Essex, between 1965 and 1978, revealed extensive evidence for a multi-phase rural Romano-British settlement, perhaps an estate centre, and five associated cemetery areas (170 burials) with different burial areas reserved for different groups within the settlement. The settlement demonstrated clear continuity from the preceding Iron Age occupation with unbroken sequences of artefacts and enclosures through the first century AD, followed by rapid and extensive remodelling, which included the laying out a Central Enclosure and an organised water supply with wells, accompanied by the start of large-scale pottery production. After the mid-second century AD the Central Enclosure was largely abandoned and settlement shifted its focus more to the Southern Enclosure system with a gradual decline though the 3rd and 4th centuries although continued burial, pottery and artefactual deposition indicate that a form of settlement continued, possibly with some low-level pottery production. Some of the latest Roman pottery was strongly associated with the earliest Anglo-Saxon style pottery suggesting the existence of a terminal Roman settlement phasethat essentially involved an ‘Anglo-Saxon’ community. Given recent revisions of the chronology for the early Anglo-Saxon period, this casts an intriguing light on the transition, with radical implications for understandings of this period. Each of the cemetery areas was in use for a considerable length of time. 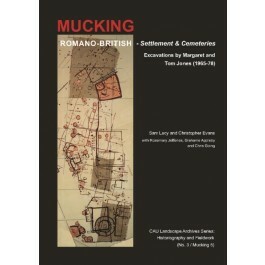 Taken as a whole, Mucking was very much a componented place/complex; it was its respective parts that fostered its many cemeteries, whose diverse rites reflect the variability and roles of the settlement’s evidently varied inhabitants. Appendix 1 Pottery imports from southeast England to Hadrian’s Wall. "The argument is well structured and clearly articulated, with a good balance between data presentation, interpretation and wider synthesis. Plans and line illustrations are helpfullyaugmented by monochrome and colour photography; good design and layout make the volume easy to read and use… a tremendous achievement." "This volume ably demonstrates the value of not giving up on important excavations that have remained unpublished for decades… reports such as this demonstrate that important evidence endures and deserves to be properly disseminated and debated. The authors have done us a great service by bringing this final volume on the excavations at Mucking to such an excellent conclusion."